I bet you won’t be able to guess my secret weapon in losing my baby weight this year. Go on, give it a try. No, it wasn’t running 50km a week like I used to. And it definitely wasn’t ‘eating less’… Ever tried to do that when you’re breast feeding? Not going to happen. OK, my ‘secret’ was habits. Yep I just focused on building (or re-building) the habits that put healthy eating on ‘autopilot’. Habits make it second nature so you don’t have to ‘think’ – especially important for us sleep deprived mammas! Seriously, without my habits I’m not sure how I would have made it through those challenging early months. 1. Eating real, home cooked meals. You know the deal, cooking at home with real food is pretty much always a healthier choice than processed factory food. Given that I work from home and live in the middle of nowhere, if I want to eat I pretty much have to cook. No, not retail ‘therapy’… Shopping for food. Basically I go to the supermarket every second Thursday and to the fresh produce market on the alternate Thursdays. Then once a month or so Finbar and I go to my farmers market and really stock up on meat and poultry which I freeze and lots of long-lasting organic veg like cauliflower and cabbage which will keep for 2-3 weeks or longer in the fridge. With my gestational diabetes I was already in the habit of keeping my meals pretty much as low carb as possible. And after learning that unlike most women with GD, my diabetes had decided to hang around for good, I’ve just kept going with the low carb thing. If you’ve tried eating low carb and have struggled it was probably because you weren’t eating enough fat. Basically we can either burn carbs or fat for energy. If you choose to avoid the blood sugar roller coaster that comes from eating carbs ( especially if you’re diabetic) then you need fat. Want to know the easiest way to enjoy your food more AND avoid over eating? It may sound like it wouldn’t help but I’ve found focusing on just eating mindfully makes a world of difference. It does take some practice but it’s a habit I highly recommend you experiment with. I have two techniques that really help. First I focus on chewing and when I feel the urge to swallow I get myself to chew a few more times. 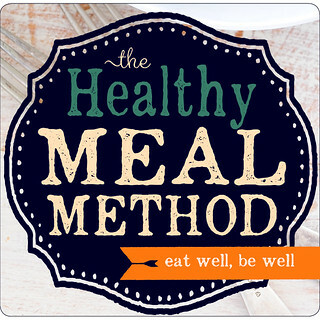 I’ve just opened up registration for my online cooking program ‘The Healthy Meal Method’. Note: Registration closes 19 August 2016. Inspired by the talented guys at Mocan & Green Grout – one of my fave cafes in Canberra. If you aren’t a kale fan, see the variations below for alternatives. There are endless possibilities. 1. Heat a large frying pan on a medium high heat. Cook bacon until crispy. 2. 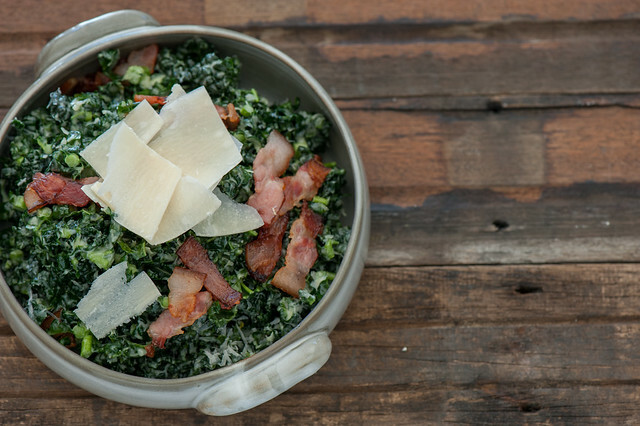 Toss sliced kale with mayo and parmesan in a large bowl. Taste and season as needed, depending on your mayo and cheese you might not need salt. 3. Divide salad between two bowls. 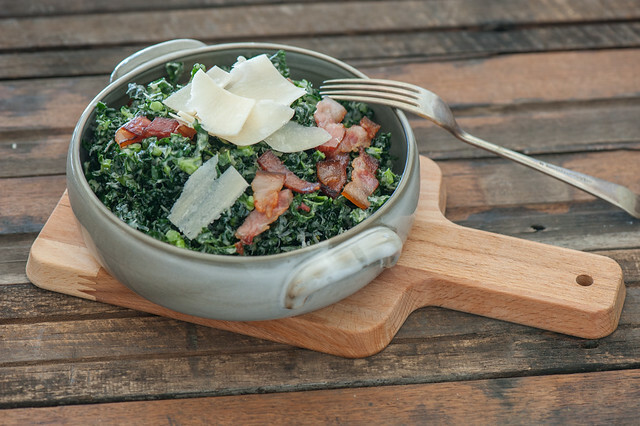 Top with crispy bacon, shaved parmesan and poached eggs (if using). dairy-free – replace the parmesan with toasted sliced almonds or chopped brazil nuts. carb lovers – toss in some torn sourdough croutons or serve with hot buttered toast on the side. different greens – feel free to use cos (romaine) lettuce, baby spinach, or any other salad. I’m keen to try it with bitter wintery radicchio leaves or witlof (belgan endive). Also great with finely shaved cabbage or brussels sprouts. vegetarian – replace bacon with smoked tofu or smoked almonds or roast peppers or sun dried tomatoes. no mayo – make a creamy dressing using 2 tablespoons lemon juice and 4 tablespoons natural yoghurt. ps. Not sure if The Healthy Meal Method can help you? Note: 2016 registration closes 19 August. No exceptions. I love this! My resolution for this year is to chew better (I like to keep my resolutions small and manageable) and it really is about building good habits. You focus on them every day until they become ingrained, and don’t take any effort anymore! I’m diabetic as well, and recently started eating LCHF. I find that if I limit carbs to no more than 50 grams a day, get 70% of my daily calories from fat, and avoid sugar substitutes, I can control my blood sugar levels without medication. It’s a miracle! Would love to know what your, and other readers, “LOTS of fat per day” is. Are we talking tablespoons, 1/2cup? I don’t know how Jules is defining more fat, but for some folks who do LCHF/Keto style eating, up to 80% of their daily calorie intake is fat. I don’t think mine is that high Tracy… But to be honest I really don’t know the percentages because I’m totally against counting calories or nutrients in any form… I eat food and try to just eat until I’m full. meat and use olive oil and butter liberally in my cooking and usually serve each meal with a dollop of Mayo or a drizzle of chilli oil or a handful of nuts… Or some avocado… So hard to tell but definitely closer to 1/2 cup per day rather than tablespoons… Great idea for a blog post to quantify! Hi Jules, do you eat any carbs at all (besides vegetables)? One of my healthy habits is to ALWAYS have 3 meals a day around the same time – no snacks in between, unless it’s coffee, tea, etc. Hi Jules glad to see you are doing lchf. I know you have just had a baby and may be breast feeding but have you investigated Interminttent Fasting. It’s great for pre diabetes and losing weight. You might want to check out Dr Jason Fung. His website is intensive dietary management. He also has lots of indepth diabetes info. Love the site and the videos. I Love this! it really is about building good habits.